You're looking rather serious in that photo. This is no time to be serious. It's easy Sunday! We hope you have a good one. Love it....just a great pic. Have a serene Sunday. Oh my those blue eyes are just like an ocean you'd like to dive into! Have a great EZ!!! Maxwell, you look... dare I say it... dignified! I could look at those GORGEOUS blue eyes for hours! Mes thinks mes should sneak over for a quick cuddle!!! What a great picture. Just look at those serious blue eyes. Just Purrfect. Take care and have a great day. Blue most certainly IS your color from your eyeballs to the blanket you lie on! I'm quite jealous of the "Mesmer-eyes" though for sure! Wowser, mouser! This took my breat away. You do look very handsome. That is quite an impressive photo, but it should be, it's you! 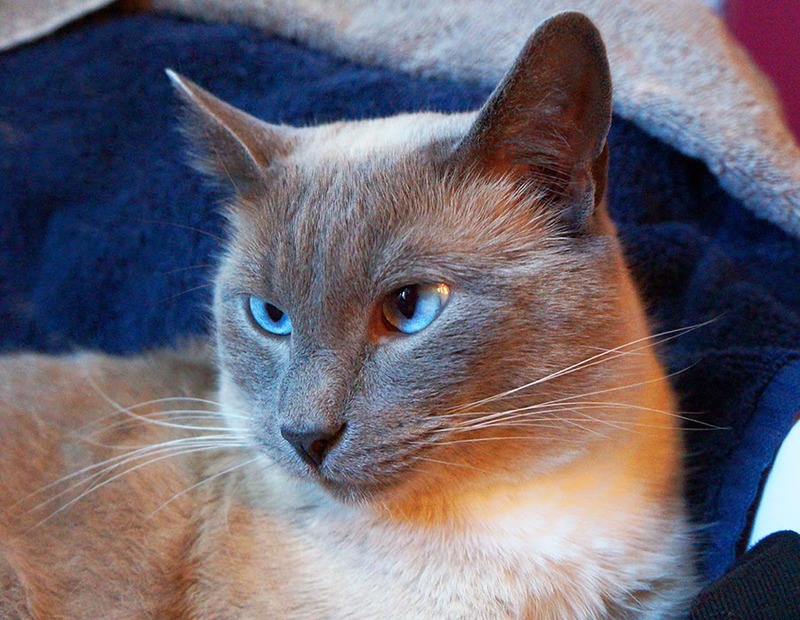 Our mom is partial to blue eyes, and you have some of the prettiest ever! Maxwell is certain he deserves all this praise, and more.